Today, December 13, 2010, NGAP received a really big surprise! We opened a letter and found a contribution in the amount of $10,000.00 from Rachael's Rescue. Of course, there is only one Rachel that everyone knows - the famous one on TV, Rachael Ray! The letter states, "...from Rachael's Rescue in recognition of all the valuable work that the National Greyhound Adoption Program performs each year to protect our nation's animals." Obviously, this money couldn't have come at a better time when money is going out faster thatn it is coming in as we complete our new surgical facility. 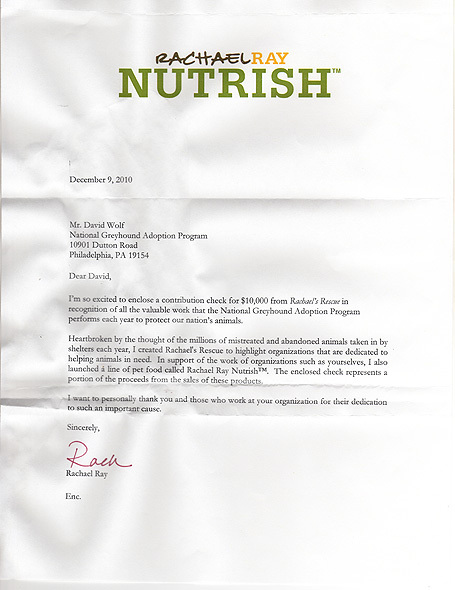 Thank YOU, Rachael Ray, for helping us to help our greyhounds!